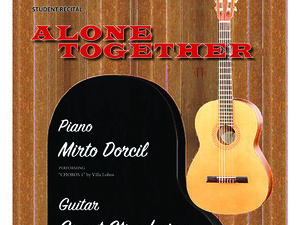 Frostburg State University students Grant Stryckning, on guitar, and Mirto Dorcil, on piano, will present their joint recital, titled “Alone Together,” on Saturday, Oct. 27, at 7:30 p.m. in the Pealer Recital Hall of FSU’s Woodward D. Pealer Performing Arts Center. The recital is free and open to the public. Stryckning will perform “Chorus 1” by Villa Lobos, and Dorcil will perform the jazz standard “How High the Moon” by Morgan Lewis. Together they will play “Agua e Vinho” by Egberto Gismonti, “Wasserfahrt am Traunsee” by Johann Mertz, “Waltz New” by Jim Hall, “Jericho” by Dorcil, the ballad “Prelude to a Kiss” by Duke Ellington, “Moon’s Lullaby” by Stryckning and the Broadway tune “Alone Together” by Arthur Schwartz. Stryckning is from the guitar studio of Patrick Sise and the jazz guitar studio of Anthony Ambroso. He is a member of Sigma Tau Gamma Fraternity and anticipates graduating in May 2019 with a bachelor’s degree in music performance, with a minor in jazz studies. A graduate of Elkton High School, he is the son of Blair Stryckning and Grant Stryckning Sr. of Elkton. Dorcil studies classical piano under Dr. Jay DeWire and jazz piano under Thomas Harrison. He was a dean’s list recipient for his freshman and sophomore years and is a recipient of the Compass Scholarship, Talent in the Arts Scholarship and the Henry Smith Jr. Music Scholarship. He anticipates graduating in May 2019 with a bachelor’s degree in music. Dorcil’s career goal is to perform around the U.S. and the world. He is a graduate of Wheaton High School.